It has been quite a while since our last mass email but we have lots to cover. I was informed by most of the alums in attendance at the returnee reception that, in fact, email is their preferred method of being updated on events, so I would like to depend more on a monthly email update than just on our Facebook group (but please join and check the Facebook page for smaller updates and events). 2) PUB TRIVIA – WEDNESDAY, FEBRUARY 6 @ PORCHSWING PUB – Pub Trivia is still alive and well but we are always looking for new blood. We have a regular group of about 4-6 JETAA members who play on the 1st Wednesday of the month (sometimes more often) but newcomers are more than welcome. Please remember that the team sizes are capped at 7 people so if you are not a member of the facebook group “Texoma Jetaa” please join and RSVP if you plan to attend so we can reserve enough tables and adjust team sizes accordingly. -The Japan festival will be held in April. There is a position on the JFEST organization committee open and if any JET is interested please let Ryan or I know ASAP. The position is for Opening Ceremony Coordinator. “This program will be held on Monday, April 22^nd from 10:30 to 1:30 p.m. with approximately 85 high school students and their teachers celebrating the students dedication and hard work in learning Japanese in school. The students are carefully selected by their teachers. If any groups or alums are starting to gather or want to start in any of the non-Houston cities, let us know and we might be able to provide some planning and financial support. We remain eager for any event ideas JET alums in the area might have. Let us know by email or post in the facebook group. FINAL NOTES: Hopefully everyone is well and the recent returnees are adjusting to being back home. 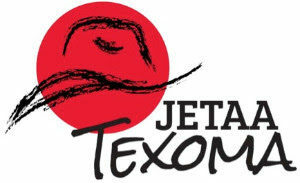 If you are not a member of the facebook group, it is called TEXOMA JETAA, and members often post short notice social events or just Japanese news or articles. Now that the new year is in full swing, we look forward to improving and expanding the offerings of our TEXOMA chapter. Hope to see or hear from more of you in 2013. Role: Coordinate all activities. Chair general meetings, monthly socials. Liaise with outside organizations. Role: Assist in coordination of all activities. Chair special projects as defined by the President or the Executive Committee. Manage membership requests and work with webmaster to update member list as necessary. Role: Record information from meetings, distribute minutes, assist Executive Officers in administrative tasks. Role: Develop annual budget. Secure funding from CLAIR and MoFA. Provide guidance to the board members on funds available for activities. Monitor bank account. Role: Ensure function of website and mass e-mail system. Update member list and ensure website has up to date information. Role: Edit and publish quarterly newsletter. If you are interested in helping coordinate events in your area of Texas or Oklahoma, please contact us. We are particularly interested in setting up and supporting local chapters in the Austin/San Antonio area, the Dallas/Ft. Worth area, Tulsa, and Oklahoma City.